Just like Scott Lang and Hope Van Dyne, Jeremy Renner’s Hawkeye didn’t appear in Avengers: Infinity War at all, not even for a quick cameo, and it turns out the Russo Brothers never had any intention of including the beloved archer to begin with. There’s a good reason for that, of course, as scribes Christopher Markus and Stephen McFeely have apparently carved out a much bigger role for Hawkeye in Avengers 4 – word is it’ll involve that much anticipated transformation into Ronin, as previous set photos have teased Earth’s Mightiest Heroes and their run-in with the Yakuza. Be that as it may, the wait to see the character back in action again hasn’t been easy and making it even harder now is this gorgeous new fan poster from none other than Boss Logic. 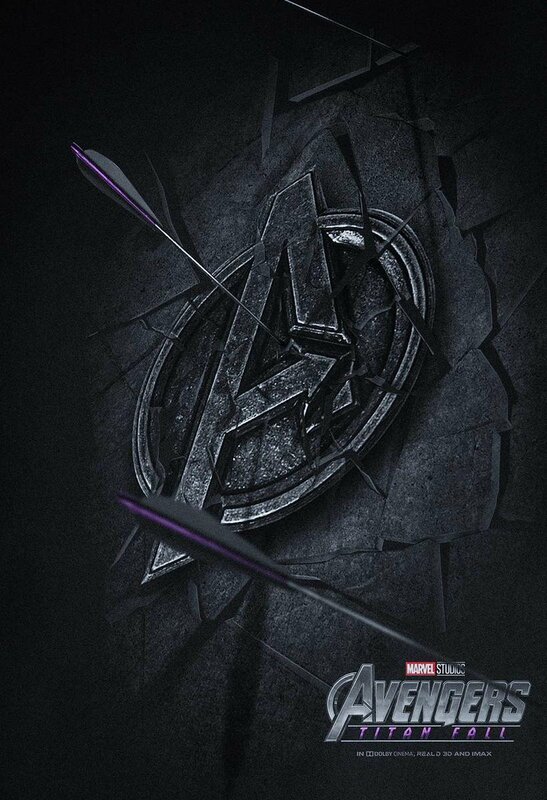 Yes, the prolific digital artist is back at it and this time, he’s brought us a simple yet effective one-sheet for Avengers 4, which teases Hawkeye’s return all the while using the title Avengers: Titan Fall. How exactly Clint Barton will find his way back to Iron Man and co. remains a mystery, but a popular theory says that Thanos may be responsible for his return. You see, the Mad Titan has successfully obtained all six Infinity Stones and reduced half of the universe’s population to dust. That much we know, but could it be that his mass genocide impacted Hawkeye, too? Perhaps wiping out his wife or one of his children? Remember, Joss Whedon toyed around with Clint’s family home during Age of Ultron, and we all know how much the Russo Brothers like to call back to the MCU of old (see: Red Skull). Perhaps the sudden death of his wife and kids is enough to bring him back then? Chalk that up as speculation for now, as details of Barton’s significant role in the as-yet-untitled Avengers 4 remain under lock and key. Still, we know to expect big things from the character and after missing him greatly in Infinity War, we can’t wait to see what Marvel has planned for him.